I frequently deploy pre-releases of our software to help test and provide early feedback to our Engineering teams. One piece of software that I deploy some what frequently is our ESXi Hypervisor and the best way to deploy it, is of course inside of a Virtual Machine or commonly referred to as Nested ESXi. 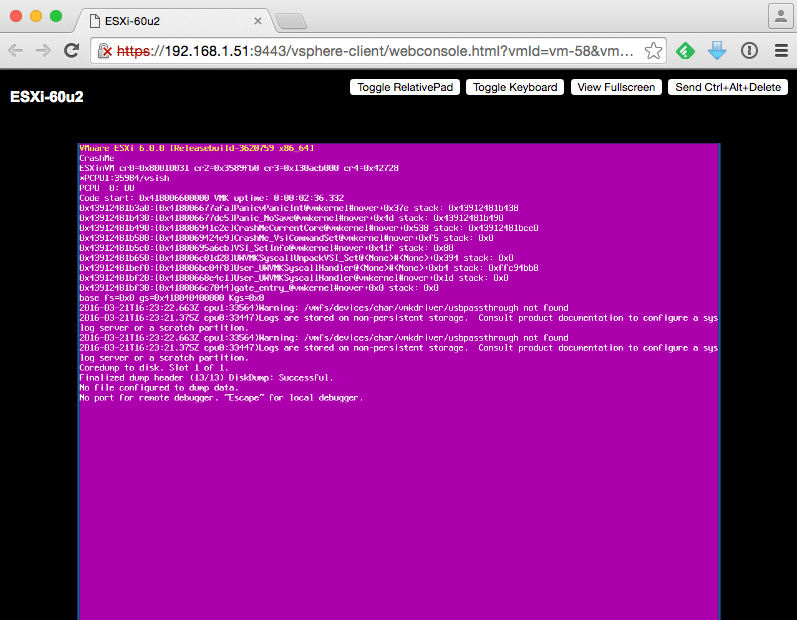 Most recently while testing a new ESXi build in my lab (screenshot below is for demo purposes, not the actual PSOD image), I encountered an ESXi purple screen of death (PSOD) during the bootup of the ESXi Installer itself. Since ESXi had not been installed, there was no place for ESXi to actually store the core dumps which made it challenging when filing a bug with Engineering as screenshots may not always contain all the necessary details. Luckily, because we are running in a VM, a really neat feature that VMware has supported for quite some time now is configuring a virtual serial port for logging purposes. In fact, one of the neatest feature from a troubleshooting standpoint was the introduction of the Virtual Serial Port Concentrator (vSPC) feature in vSphere 5.0 which allowed a VM to log directly to a serial console server just like you would for physical servers. You of course had few other options of either logging directly to the serial port of the physical ESXi, named pipe or simply to a file that lived on a vSphere Datastore. Given this was a home lab setup, the easiest method was to simply output to a file. To add a virtual serial port, you can either use the vSphere Web/C# Client or the vSphere APIs. Since this is not something I need to do often, I just used the UI. Below is a screenshot using the vSphere Web Client and once you have added the virtual serial port, you need to specify the filename and where to the store the output file by clicking on the "Browse" button. If the GuestOS which includes ESXi has been configured to output to a serial port, the next time there is an issue and you can easily captured the output to a file instead of just relying on a screenshot. One additional tip which might be useful is by default, vSphere will prompt whether you want to replace or append to the configured output file. If you wish to always replace, you can add the following VM Advanced Setting and you will not get prompted in the UI. Virtual serial ports are supported on both vSphere (vCenter Server + ESXi) as well as our hosted products VMware Fusion and Workstation. 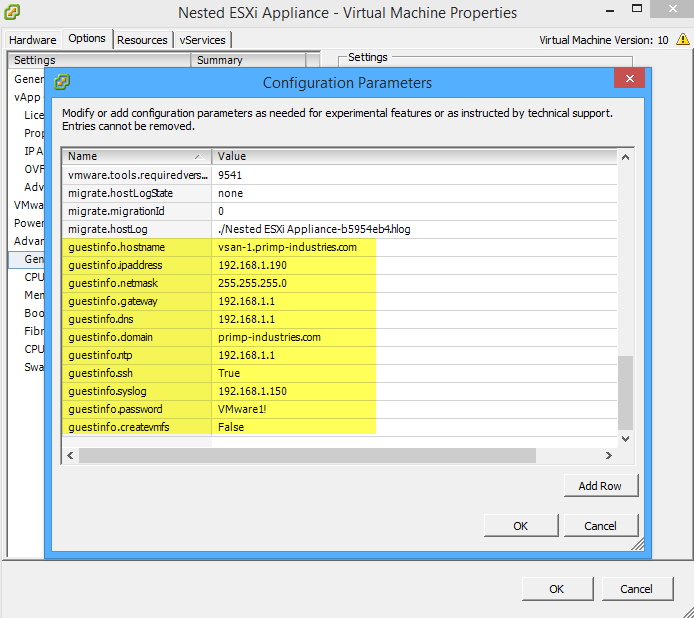 Several months back I had built an ESXi Virtual Appliance that allows anyone to quickly stand up a fully functional Nested ESXi VM which includes guest customization such as networking, NTP, syslog, passwords, etc. 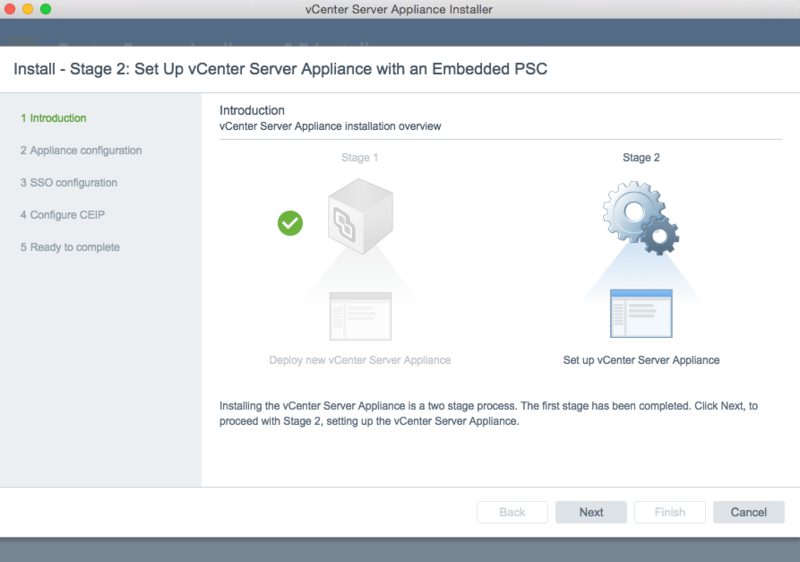 The virtual appliance was initially built for my own personal use as I found myself constantly rebuilding my lab environment for evaluating and breaking new VMware software. I figured if this was useful for myself, it probably could benefit others at VMware and I posted the details internally on our Socialcast forum. Since then, I have received numerous stories on how helpful the ESXi Virtual Appliance has been for both our Field and Engineering for setting up demos, POCs, evaluations, etc. Most recently, I was contacted by Massimo Re Ferre' (crazy Mainframe guy ;)) who works over in our Cloud Native Apps team and was working on a pretty cool project with Photon Controller which was recently open sourced. 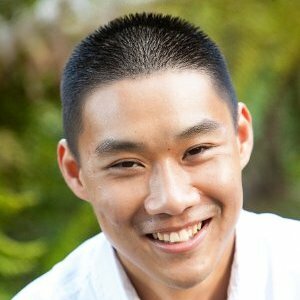 He was interested in leveraging the ESXi Virtual Appliance along with using VMware AppCatalyst to make it super simple for anyone to try out the Photon Controller in their own environment. Over the last couple of weeks, I have been working closely with Massimo on incorporating on his requirements for the Photon Controller POC back into my ESXi Virtual Appliance. My original goal for the appliance was to keep it generic so that it could cater to multiple use cases and Photon Controller POC was just another neat solution that could be built on top of. 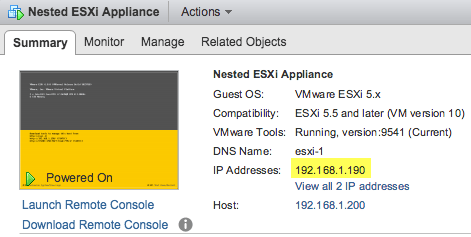 As part of the release, the ESXi Virtual Appliance is also made avialable which I thought was pretty cool! 😀 I highly recommend you check out the awesome work done by Massimo if you want to play with Photon Controller. This is a really easy way of getting started with Photon Controller and giving it a spin in your own environment. 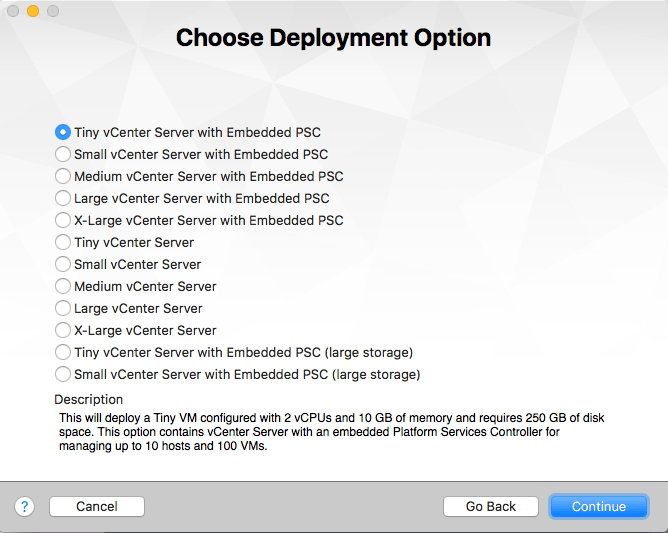 Since the ESXi Virtual Appliance is now available externally, I wanted to share a few details about the appliance for those who might be interested in checking it out. As I mentioned earlier, the goal of the ESXi Virtual Appliance was to be generic and to be used as a build block that could enable different use cases such as spinning up a quick vSphere lab using it and the VCSA or putting together a fully functional VSAN lab in literally a couple of minutes (at the very bottom, I have a couple of PowerCLI scripts to demonstrate this). You could deploy 3 instances of the appliance to get a basic 3 Node VSAN Cluster or you could scale up to 64 Node VSAN Cluster all within just minutes. The limit is truly your imagination. 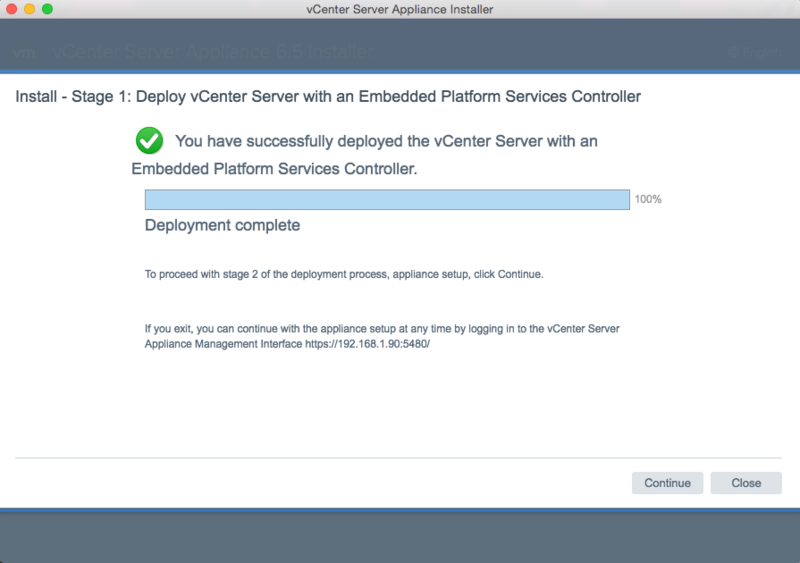 The appliance contains a pre-installed GA release of ESXi 6.0 Update 1. 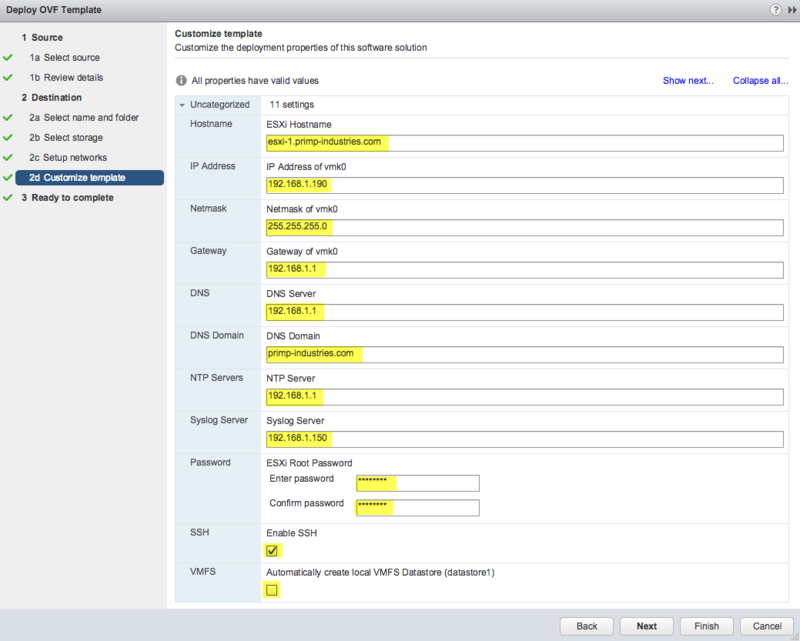 There are 11 OVF properties that are available for customizing the Nested ESXi VM which are shown in the table below. Once powered on, the default 60 day evaluation will start counting down as if you had manually installed ESXi yourself. In addition, the OVA also contains several optimizations for running Nested ESXi including the Mac Learn dvFilter params as well as other configurations for quickly setting up a VSAN environment which are also described below. I have also built the appliance to be easily consume in all VMware based environments including vSphere, vCloud Air, Fusion, Workstation, Player & AppCatalyst. UPDATE (05/09/17) - The ESXi 5.5u3 has been decommissioned due to its limited use. 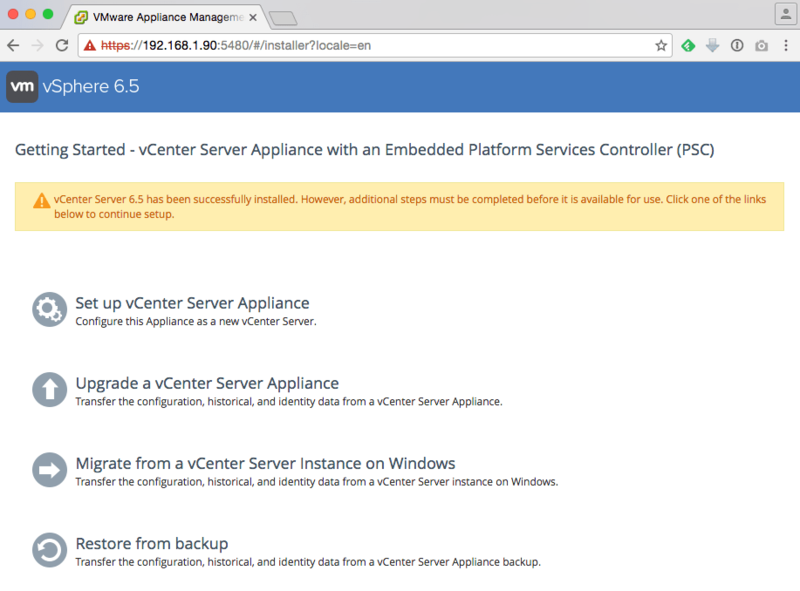 UPDATE (11/18/16) - ESXi 6.5 Virtual Appliance has been released and you can find the details here. If you do not wish to use VSAN, there is an OVF property that allows you to specify whether or not a default VMFS datastore is created. You can increase the capacity of any of the disks after deployment (if you wish for the automatically VMFS creation, you will need to expand the disk prior to powering on the VM). Below are the different methods in which you can deploy the ESXi Virtual Appliance which includes vSphere, vCloud Air, Fusion, Workstation, Player & AppCatalyst. 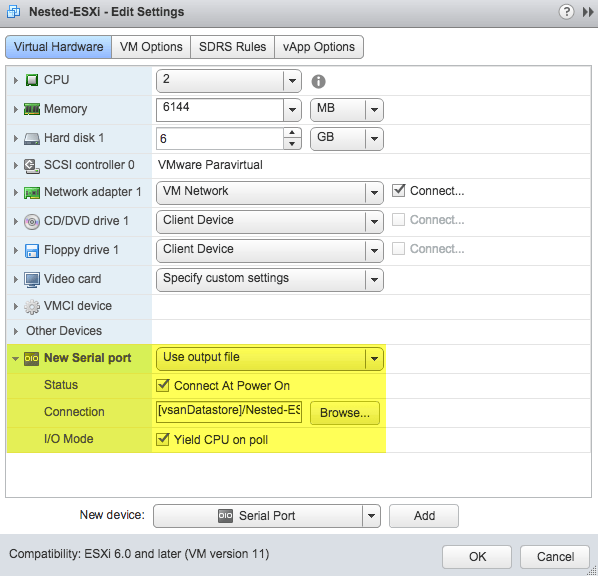 The idea is that you can easily setup Nested ESXi on any VMware based hypervisor and be up and running in just minutes! Download the OVA and import it into ESXi using either the vSphere C# Client but do not power it on. 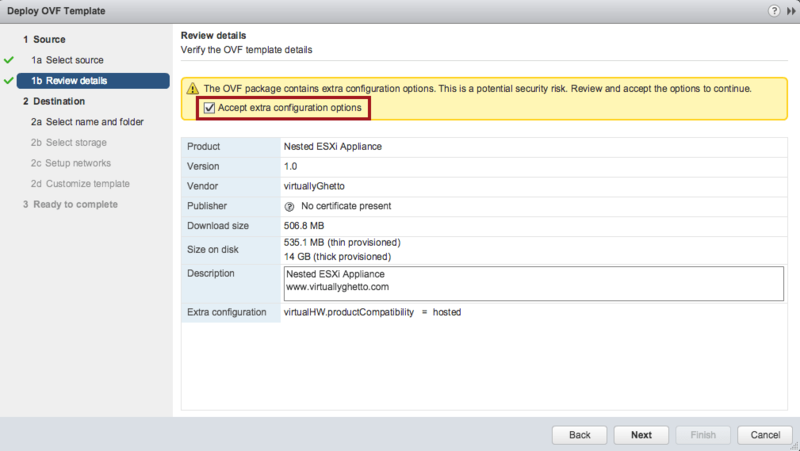 Since ESXi does not support OVF properties, you will need to add the following guestinfo*. properties as shown in "Option 3" below by using the VM Advanced Settings UI. 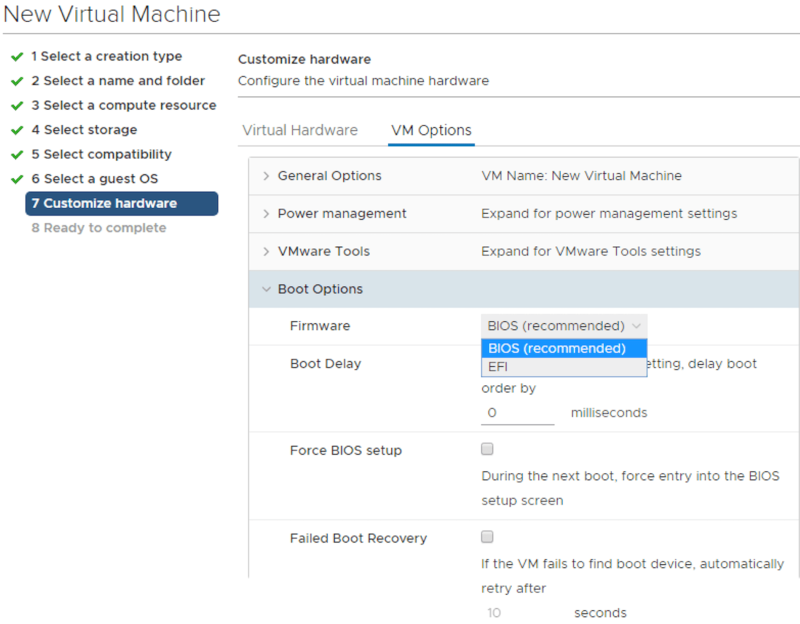 If you prefer NOT to mess around with manually adding these VM Advanced Settings which can also be automated using the vSphere API or PowerCLI, one additional method which CAN make use of the OVF properties is by using ovftool which is a CLI to import the OVA and using the --injectOvfEnv option that was added in ovftool version 4.x You can find more details in this blog post here. Download the OVA and import it into Fusion/Workstation but do not power it on. You will then need to edit the VMX file and add the following guestinfo. * properties as shown below since Fusion/Workstation do not support OVF properties. If you wish to increase the VMDK capacity and automatically have a VMFS datastore created for you automatically, be sure to expand the VMDK prior to powering on the VM. 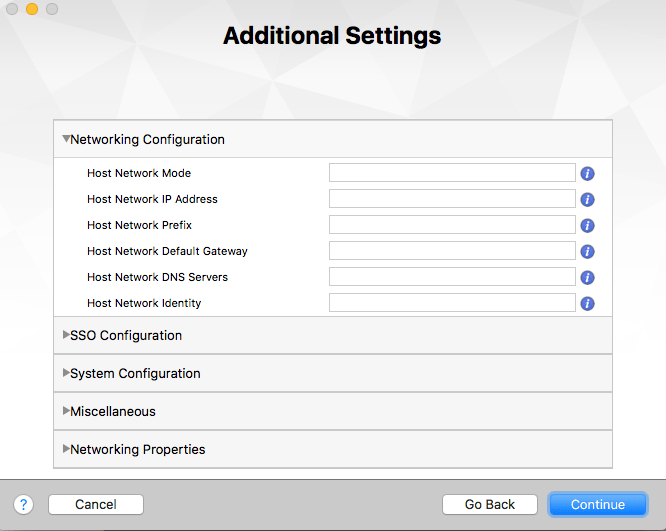 Once you have saved the changes, you can then power on the Nested ESXi VM and the customization process will start and in a few minutes you should have a fully functional Nested ESXi VM. guestinfo.hostname = "vsan-1.primp-industries.com" guestinfo.ipaddress = "172.16.78.90" guestinfo.netmask = "255.255.255.0" guestinfo.gateway = "172.16.78.1" guestinfo.dns = "172.16.78.1" guestinfo.domain = "primp-industries.com" guestinfo.ntp = "172.16.78.1" guestinfo.ssh = "True" guestinfo.syslog = "192.168.1.100" guestinfo.password = "VMware1!" guestinfo.createvmfs = "False"
Download the the OVA and import that into AppCatalyst using ovftool but do not power it on. You will then need to edit the VMX file and add the following guestinfo. * properties as in the above example for Workstation/Fusion in addition to the following params listed below which are required for Nested ESXi to run in AppCatalyst. If you wish to increase the VMDK capacity and automatically have a VMFS datastore created for you automatically, be sure to expand the VMDK prior to powering on the VM. guestos = "vmkernel6" virtualhw.version = "11" svga.vgaOnly = "true"
Once you have saved the changes, you can then power on the Nested ESXi VM and the customization process will start and in a few minutes you should have a fully functional Nested ESXi VM. The second script will go ahead and add the deployed Nested ESXi VMs to a vSphere Cluster and then enable VSAN on the vSphere Cluster.